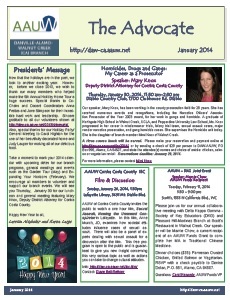 Download our January 2014 Advocate: To read and print out the entire newsletter, click the above image. Please be patient, the file size is over 1.5 Mg. Please support our advertising sponsors: Danville Band, Diablo Printing, East Bay Flowers, Educational Consultant (Melanie Wade), Attorney Sarah Nix (Gagen McCoy), Jennifer Krommenhoek (Sotheby’s Realty), Omnibus Organizing (Joy Perkins), Spirit Space (Bill Williams), Rodney Worth’s restaurants. Submission deadline for the February 2014 issue of The Advocate is January 15. Please provide all website, newsletter or calendar submission through our submittal webpage.